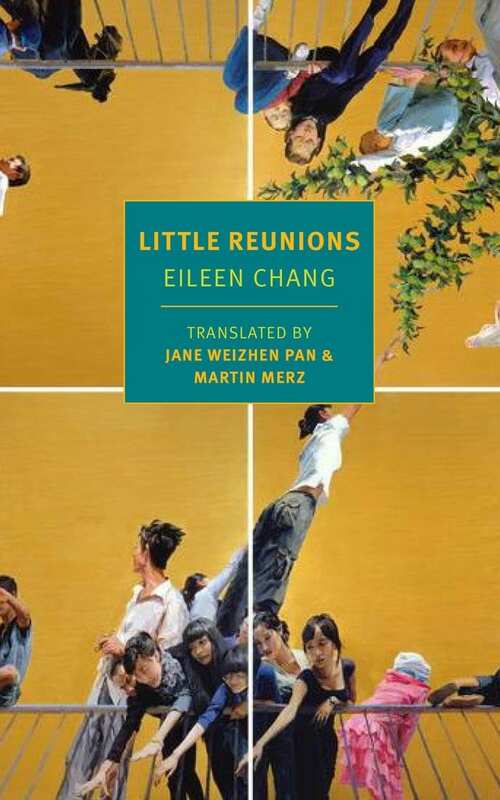 Jane Weizhen Pan and Martin Merz’s English translation of Eileen Chang’s Little Reunions (小團圓) will bring a wider appreciation for the scope of Chang’s literary production. The manuscript, completed in 1976, was left unpublished in Chang’s lifetime, an exemplar of the Russian idiom pisat’ v stol, or “writing for the drawer.” It did not appear in print until 2009, fourteen years after her death. The novel loosely mirrors key moments in Chang’s own life and readers intrigued by Chang’s biography will flock to this book looking for more insights into her personal enigmas. But from another angle, the novel stands as a testament of how to narrate a life undone by history, all the while expressing the persistent desire to remain ultimately free from any historical overdetermination. The novel tells the story of a young woman named Julie from her childhood to middle age. While it follows a general chronological progression, the narrative often flips back and forth between past and future, as the hero’s memories cascade beyond the bounds of temporal linearity. Julie’s parents are divorced; her father is an opium-addicted scion of a declining gentry family, and her mother, Rachel, lives independently, travelling back and forth between Shanghai, Hong Kong, and Europe. Julie’s relationships with her parents are like most such relationships in Chang’s oeuvre: her father is both emotionally and physically abusive, her mother perennially absent and unbearably distant when present. Julie and her mother’s occasional reunions are marked by guilt and recrimination, with the constant insinuation of debts both financial and emotional. Eventually, Julie makes her way to university in Hong Kong, where she survives the Japanese invasion in December 1941. Moving back to Shanghai, she takes up with an official in Wang Jingwei’s puppet government, Shao Chih-yung. The rest of the novel covers the denouement of this relationship, her final meetings with her mother, and brief interludes of her future life on a different continent. Against the May Fourth dogma that saw the individual subject firmly embedded within the collective historical subject, Eileen Chang has always stood out in her steadfast refusal to treat a human life as merely a function of greater forces. For this she was criticized by many, including the critic and translator Fu Lei in the 1940s who castigated Chang for her lack of civic mindedness and historical consciousness. In response, Chang boldly and perhaps glibly responded, “[All] I really write about are some of the trivial things that happen between men and women. There is no war and no revolution in my works.” Grand, epic history was for Chang too formulaic, too ready made to ever capture the complexity of any life; lying at the root of this historicist pretention was a suffocation of individual will and freedom. Thus, she dismissed H. G. Wells’s attempt in his 1920 The Outline of History to write a grand account of human civilization from geological beginnings to a utopian unified global state in the distant future as being simplistic and totalizing. 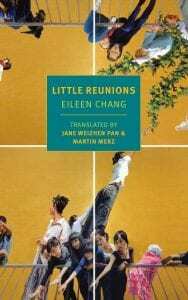 In Little Reunions Chang acknowledges how history can cut into one’s most intimate, private moments. However, the call of history does not guarantee how one might respond to such interpellation. When Julie is a student trying to survive the bombing of Hong Kong, she reflects on the unwelcome intrusion of current events into her life: “Julie didn’t like modern history, but now modern history was pounding on her door” (44). It is hard to think of a more succinct phrase that encapsulates Chang’s wry attitude to the demands of history. It pounds on the door, beseeching an answer. And yet the only possible option for Julie, the only one that will ensure her survival, is to refuse to answer. This image of history standing just outside the door highlights a relation of contiguity rather than outright opposition. However Julie decides to answer, she can never shake off how history will shadow her life up to the end of her days. This contiguity is further highlighted by the fact that Julie eventually shares a bed with Chih-yung. Things become complicated when the object of one’s longing bears responsibility for the fate of multitudes. Chang’s work rejects any easy way out of this: she refuses to judge Julie for continuing her romance with Chih-yung long after he is in hiding from the Nationalist authorities and after her realization of his feckless infidelity. At the same time, she does not excuse Julie for her actions and attachments. Instead, Chang seems to remind us that war makes strange bedfellows of us all, and that in such circumstances it is natural not to know exactly who lays beside us (during the war, both Julie’s mother and aunt find themselves in equally awkward romantic dalliances with foreign partisans). Julie cannot possibly be asked to assume responsibility for Chih-yung’s life and actions. On the other hand, however, the novel does not deny that Julie’s infatuation leaves her compromised. Ultimately Chang leaves us with an eloquent narrative plea of no contest. History sneaks into the narrative in far more interesting, subterranean ways. The novel opens (and ends) with a description of Julie getting ready to write an exam along with her nervous classmates in Hong Kong on the eve of the Japanese invasion: “Only the somber mood of troops waiting in the dawn before battle can compare with the morning of final exams, like the rebel slave army in Spartacus silently peering through the predawn mist at the Roman troops maneuvering in the distance—surely the most chilling moment in any war film—everything charged with anticipation” (3). The novel is tied together with this somewhat torturous analogy, which compares taking an exam with a slave rebellion. The specter of war proleptically haunts the everyday—anyone familiar with Chang’s life and stories will know what is about to happen. And yet this specter is filtered through a Hollywood flick that was released nineteen years after the Battle of Hong Kong. Historical consciousness is mediated through multiple forms, genres, and media, and the temporal sequence of such events is subject to the narrative’s free flow of memory. Yes, Chang gives history its due, but also subdues it under her control through her ability to rearrange the narration according to her will (thus demonstrating a mastery of manipulating a narrative’s siuzhet). Against the proper accounting of a historical sequence, Chang instead reduces it all to an omnipresent, overwhelming sense of apprehensive waiting that informs every personal and collective moment. The title, Little Reunions, refers to the traditional narrative and dramatic conceit of the “grand reunion,” whereby the major characters, having undergone obstacles and separations, finally reunite in grand comedic (in the classical sense) fashion. Sometimes the mechanisms by which this reunion is assured stretch credulity—lost loves are resurrected from the dead, or the Emperor himself may coerce a reluctant father to acquiesce to his daughter’s preferred match. In many cases, this grand reunion often implies a sense of roundedness for the cosmos itself, a hope that affairs will find their proper resolution in personal and public domains. The text’s closure may performatively hint at a satisfying closure in real life. Chang’s title signals how her text demurs from any such grand closure—there is no question of whether a unified world utopia sits on the horizon. In its place are repeated small reunions, each seemingly less satisfying than the one before, but desired all the same. Pan and Merz’s decision to translate 小团圆 with a plural noun (as opposed to Little Reunion) is sagacious in suggesting how an epic, final sense of closure is instead replaced by a “bad infinity” of disappointments. These moments echo Lauren Berlant’s “cruel optimism,” illusions of future happiness that bind us to conditions that in fact prevent us from genuine improvement. At some point, even optimism itself falls from the picture. Whereas Chang always insisted that history cannot be told in any straightforward fashion that conveniently connects cause to effect, this novel demonstrates with equal force her claim that no account of a life, even one told from the vantage point of a lifetime of experience, can be sufficiently told from beginning to end. One senses this already when reading her early stories from Romances of the 1940s, but the point hits home with more poignancy and grace in this later work. If the narrative features endless repetitions of disappointed hopes, Little Reunions is also a recapitulation of events from Chang’s own life and of her previous tales. Like a melody played in different keys and arrangements, Chang’s literary work is often an exploration of the many ways the same storylines can be told and rehearsed. Pan and Merz have produced a translation that reads easily and captures Chang’s gift for melding ordinariness and irony into a lyrical whole. This is all the more remarkable because many of the characters operate in a polyglot, cosmopolitan environment, whose Chinese names are often meant to resemble English ones. Moreover, as many characters are members of large gentry clans, they inhabit a complicated web of kinship relations that would make anyone’s head spin (and some of the most central kinship relations are themselves fabrications). Pan and Merz have provided an indispensable index of character names that I had to frequently consult to keep track. It is a testament to Chang’s brilliance that, in spite of her prodigious roll call of characters, and her constant shifting of narrative events, one need not keep a mental inventory of all characters at all times to understand what is happening. Despite Chang’s penchant for meticulous detail, she does not neglect the ultimate importance of narration over mere description. Pan and Merz’s assured translation will give readers confidence in taking on one of Chang’s more challenging narratives. I write this review during another atrocious summer of horrendous news: migrant children cooped up in cages, deadly heatwaves that augur future climate disasters, geopolitical somersaults between the great powers that make many of us scratch our heads to the bone. We see how history is happening to other people, and how it is coming after us as well. I’m sure even those of hardier political and moral convictions nevertheless feel a sense of dread at the sheer uncertainty of the disruptions that loom on the horizon. Little Reunions may perhaps speak to the present moment by giving us an honest, unsparing depiction of how a person may react as their life is gradually torn apart by forces beyond their control. Without apology and without justification, Chang showcases the complicities, mental rationalizations, and survival mechanisms that might befall any of us thrust in such a situation. And when all the tumult is finally over with, we see how such a person tries to salvage what is left and continue to hold on to a life, even if it is only a mere semblance of the hopes and dreams they previously held for it. Of course, a lot of these themes of desolation and disappointment appear in Chang’s early work in Romances. Often these tales are punctuated with extreme images of the grotesque or incredulously dramatic reversals of fortune. These dramatic moments do not feature as much in Little Reunions, perhaps signaling an author who can let go of such narrative conceits and rely instead on the formidable weight of her aesthetic powers. While I found the narrative leaps between memories a little jarring in the beginning, as I read further I became intoxicated by the novel’s rhythm of melancholic drag. At the end, I perhaps didn’t understand Julie better as a character, or Chang as a real person. And yet I appreciated the honesty with which Chang has sought to tell a story of a person’s life, for whom I genuinely hoped that whatever little reunions came their way offered some solace. It may be all we can hope for ourselves. Eileen Chang. Written on Water Tr. Andrew F. Jones (New York: Columbia University Press, 2005), 18. See Chang, Written on Water, 40. Lauren Berlant, Cruel Optimism (Durham, NC: Duke University Press, 2011), Kindle Edition.